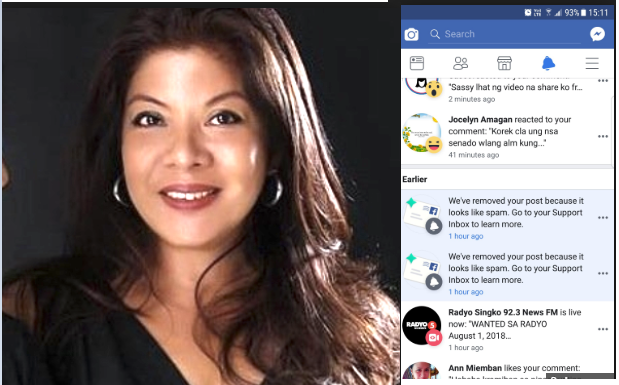 Following the outrage of the netizens over termination of a Facebook page, taking down videos and posts related to elections fraud or Senate hearing, Presidential Communications Operations Office (PCOO) Undersecretary Lorraine Marie Badoy reached out to Facebook for an investigation. On her post on Saturday, Usec. Badoy said that she reached out to Mr. Alvin Tan, Head of Public Policy, Southeast Asia Facebook who promised to give feedback as soon as possible. “When I asked if this particular post was reported by someone so that FB took it down, FB said, “Page was automatically detected by the system” the PCOO official said. In addition, Facebook was also asked how the system automatically detects a fake admin – but no feedback yet. The doctor-turned-PCOO-official also told the netizens to reach out to Facebook or report any posts that were not returned (if there’s any). When I asked if this particular post was reported by someone so that FB took it down, FB said, “Page was automatically detected by the system”. As of this time, I am waiting for a response from Facebook. They’d be happy to take a look into each of your posts. If the post has been taken down and not returned, just a report will do. In my experience with them, response is quick and accurate. As for your complaints that someone inside Facebook is taking down these posts, I was assured by Alvin Tan, Head of Public Policy, Southeast Asia Facebook, that this isn’t true. I am not leaving it at that. This is ongoing conversation I am having with Facebook and I would like for you to rest assured that I will represent you and your concerns well. Doesn’t even matter to me if our political beliefs do not match. That is, if you love the Marcoses –and as you know, I don’t. Or if you love Leni –and as you know, I don’t. I will serve you, the Filipino people—in whatever part of the political spectrum you’re on—red, yellow, blue, white, black (may ganon ba?) This is what I vowed to do when I took my oath of office. To serve the Filipino people with utmost fidelity. I mean to remain faithful to it. I only ask that you trust me so you will find out that I am worthy of your trust.